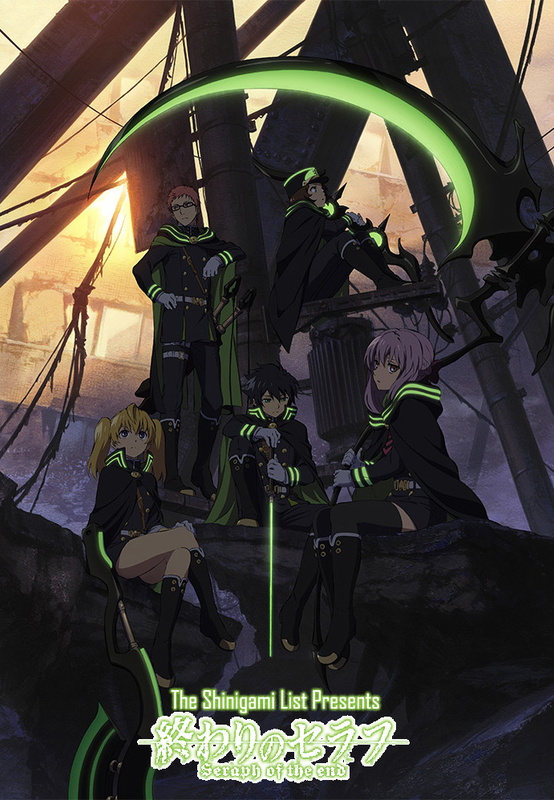 Owari no Seraph (終わりのセラフ), translated as Seraph of the End, is an original Japanese manga by mangaka Takaya Kagami and illustrator Yamato Yamamoto. The story begins with the world itself – the human children being used as feeding docks for the vampires… One such child is Yuuchirou Hyakuya. He has been living a life of imprisonment, alongside a number of other human children. They grow with the knowledge that they are the only ones left of the world, but one escape attempt leads Yuuchirou to the outside. He comes to know the truth. 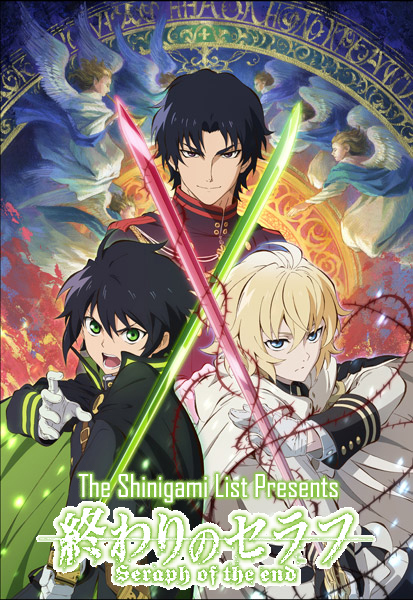 Owari no Seraph will air on 4th April, 2015. Stay tuned to see how humans and vampires take on each other once more! The real story begins when Yuuchirou ends-up being the only one of the children who manages to escape the vampiristic hell. Thinking all others have died trying to run away, he gets as far as possible from the place he loathes. Only to end up discovering that the world is in fact full of humans and not only – there are those who oppose the vampires. So, Yuuchirou decides to enrol in the local Imperial academy. Once in the Japanese Imperial Demon Army’s Demon Moon Company, he is a sight to behold. But is his hatred towards the vampires stronger than his sense of family? Lieutenant Colonel Guren Ichinose is the background-protagonist in the story. He is the leader of the company and one of a very few elite members of the Army. His seiyuu is Yuuichi Nakamura (Tokyo Kushu’s Renji Yomo). Private Yuuichirou Hyakuya is the protagonist in Owari no Seraph. He is the only child who manages to escape from the entrapped life he led alongside Mikaela and the other children. Belongs to Shinoa’s squad. His seiyuu is Miyu Irino (AnoHana’s Jinta Yadomi). Private Yoichi Saotome joins the squad alongside Yuuchirou, but he has a harder time developing the necessary abilities in the academy. Nonetheless, he is one of the members of the Demon Moon Company. Belongs to Shinoa’s squad. His seiyuu is Nobuhiko Okamoto (Ao no Exorcist’s Rin Okumura). Sergeant Shinoa Hiragi is a 16 y.o. squad leader of the human race. Her family is one of the highest-ranking human families in the Owari no Seraph universe. She loves to tease and is very sarcastic. Her seiyuu is Saori Hayami (Sword Art Online’s Sachi). Special Private Shiho Kimizuki is another one of the members of Shinoa’s squad. His only motif for joining the forces is that his sister, although still a child, was infected with the Apocalypse Virus and it is the army that might be the only ones holding a key to her getting better. His seiyuu is Kaito Ishikawa (Haikyu! !’s Tobio Kageyama). Second Lieutenant Shigure Yukimi is a member of Guren’s Squad and a proud member of an Ichinose retainer family. She is absolutely loyal to Guren and has accepted the demon weapon only to be able to protect the heir to the Ichinose family. Her seiyuu is Yui Ishikawa (Shingeki no Kyojin’s Mikasa Ackermann). Second Lieutenant Mitsuba Sangu serves in Shinoa’s squad. She is always there for her peers and colleagues. She is a by-the-book person with an easily irritated personality. Her seiyuu is Yuka Iguchi (Toaru Majutsu no Index’s Index). Second Lieutenant Sayuri Hanayori is a member of Guren’s squad and a very kind person. She also belongs to a retainer house to the Ichinose clan. Her overall story matches that of Shigure, but they don’t consider each other competitors. Her seiyuu is Atsumi Tanezaki (Zankyou no Terror’s Lisa Mishima). Seventh Progenitor Ferid Bathory is the main villain in Yuuishirou’s life as he was also the vampire at whose zone the children were used. He likes to judge others and is the typical jester-sadist type of character. His seiyuu is Takahiro Sakurai (Tokyo Kushu’s Uta). Mikaela Hyakusya is Yuuichirou’s best friend from the time of their imprisonment and the only other survivor of their nearly-failed escape. Now a vampire, although incomplete, he is a full-fledged servant of Krul Tepes. His seiyuu is Kenshou Ono (Kuroko no Basuke’s Tetsuo Kuroko). Why are all these army officials so young? It is the Apocalypse Virus – the very plague that erased most (though not all, as would the vampires claim to their entrapped “meals”) of humanity. It attacks adults, but it leaves the children safe. The reasons behind the very existence of this virus are yet to be discovered. However, one thing is certain – without it, the vampires wouldn’t be able to rule over humanity that easily. Now this is something I can’t wait to try. I have read the manga and I was quite pleased with it. My POV: the lolis can be uite annoying at times, but for the sake of wondering what gender Mika is, it was totally worth it :P Too bad they have solved this issue for now. Looks rather terrible. Standard style of animation, a lot of children and a tasteless plot.